The Eight Mansions Feng Shui or East/West Feng Shui theory as it is often called uses directions as its foundation for manipulating energies. It can be very useful and helpful especially if you do not have a build date that is exact. This method works well with the Form school and Flying Stars Feng Shui or Xuan Kong. This particular theory has to do with analyzing the energies of your environment against the energies of your personal trigram characteristics to evaluate their compatibility. This is where a feng shui evaluation will begin the first step of combining personal information to calculate in conjunction with building information to give you a more accurate interpretation unique to the individual. In this theory there are two specific pieces of information are going to be used in the evaluation. 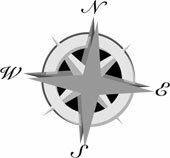 The birth-date/ trigram information of the occupant, and the compass degrees direction of the house. This will clearly show the compatibility of you and your home. The point to the East/West theory is that there are two types of people and two types of houses. You should most likely be a match for your house and this is supposed to bring better luck and feng shui. The option of matching your homes direction means that you will experience and optimal harmony while living in that house. If you are not a match for your house then the clash of directions is present. Living in an opposing house is not as bad as it sounds according to East/West theory. Some of the houses good areas may match some of your own, like perhaps entry doors or rooms you spend a lot of time in. Main doors and bedrooms are some of the most important to consider in because they have greater impacts on us as occupants. Now is it better to follow your directions for you or to use the directions of the house? This is a an age old question that is best determined with some experimentation. Perhaps you can use some of your homes good areas to your advantage and avoid some of your own less favorable areas. All of these have different affects and it is nearly impossible to determine which one will take over. There are several factors in determining which is going to be stronger; your active chi or your house more yin chi. There is no set rule for this, I live in a new house and can tell you it goes back and forth since the chi is very new and active in the house.